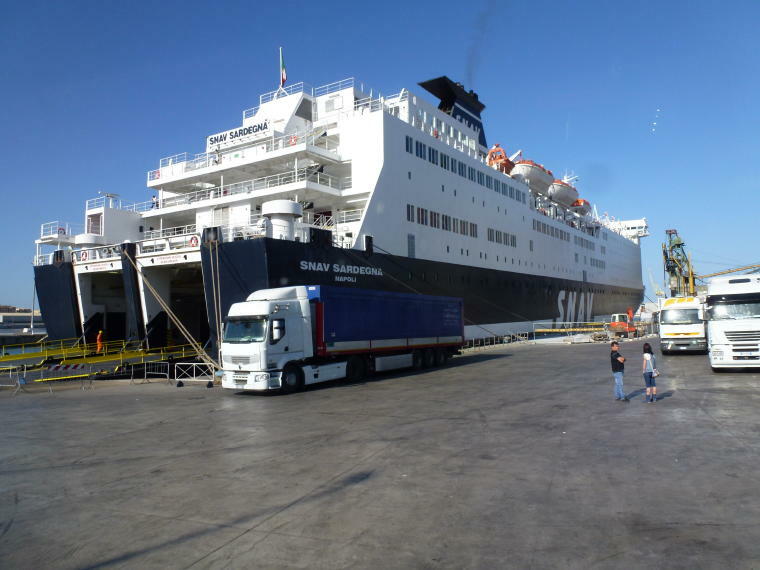 After our formal tour with Insight Tours, we were on our own for four days. We took an early morning fast train to Florence (only 1.5 hours). 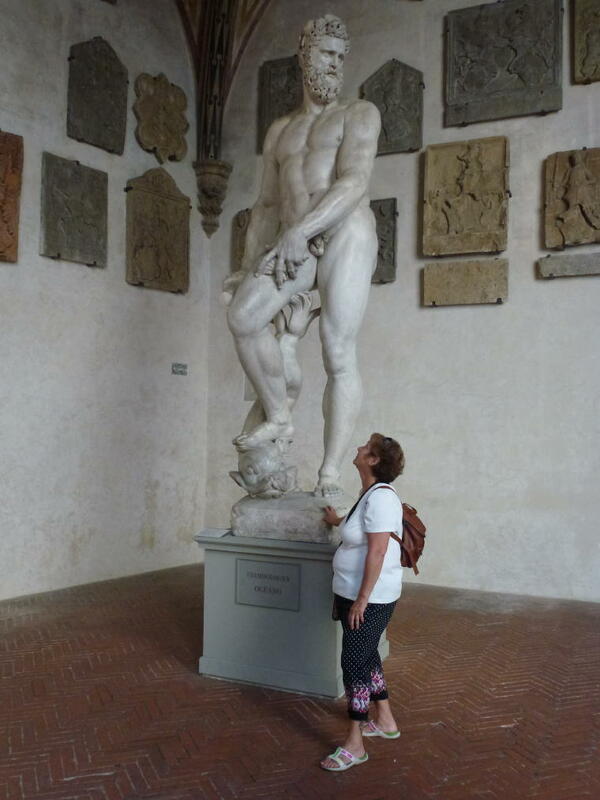 Barbara remembered seeing Michelangelo's statue of David on our last visit 30 years ago and she couldn't wait to visit him again. 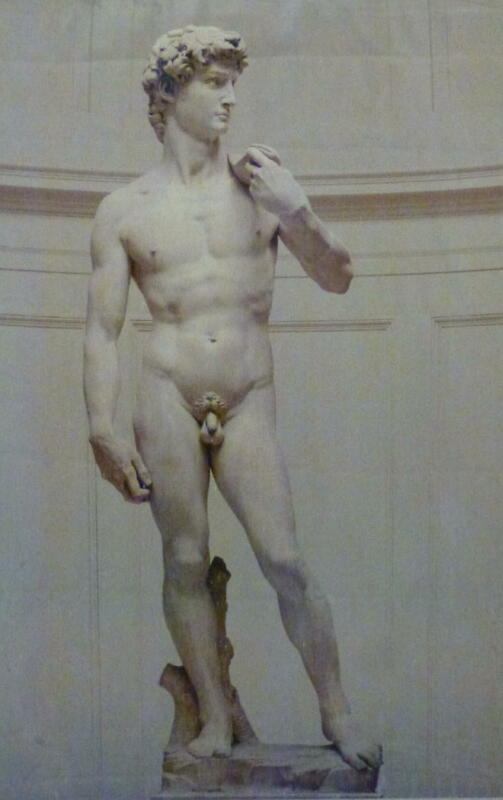 At 17 feet tall, he is a magnificent marble sculpture with great details including the veins in his arms. The statue was originally commissioned to stand along the roofline of the Duomo. But instead they decided to place it guarding the entrance to the Palazzo Veccchio. It was there for 350 years before moving it to the Accademia. No photos were allowed in the Accademia so this is a postcard picture. Besides David, the Accademia also contains many other wonderful sculptures by Michelangelo and others. Barbara had downloaded Rick Steve's Florence Tour Book on her Kindle and we used his step by step tour descriptions of the most important sites to guide us through the various museums. After our visit to David, we walked over to the Medici-Riccardi Palace. The palace was built in 1444 for the Medici family. They were the Rockefellers of the times, ruling Renaissance Florence. Michelangelo studied sculpture and liberal arts here as a teenager. 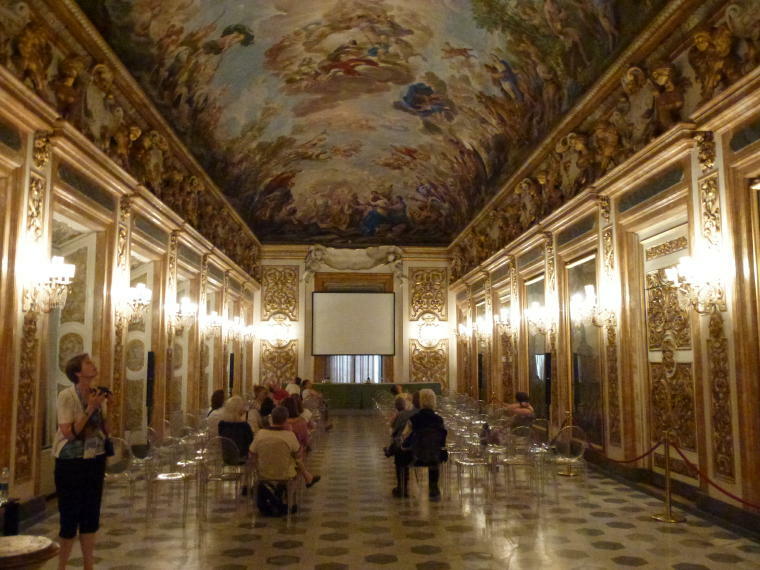 The palace was later extended by the next owners, the Riccardi family, in the 1700's.The palace has several exhibits of art and sculptures but the most impressive was the Luca Giordano Room with its ceiling, The Apotheoisis of the Medici Family. The ceiling was frescoed in 1685 by Giordano. It features the Medici big shots frolicking with Greek gods. 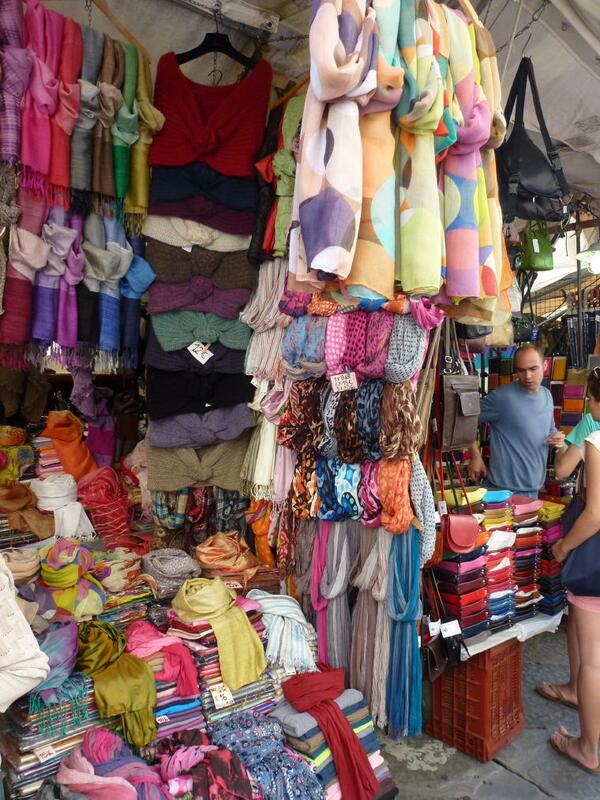 After touring the Accademia and the Medici-Riccardi Palace, we wandered through the famous San Lorenzo Market with its many stalls of scarves, leather goods and souvenirs. Then we headed back to our hotel, Katti House. This is a small pension on a quiet street near the train station. It was recommended by Rick Steves in his Tour Book as a clean, inexpensive place to stay and we were delighted with it. 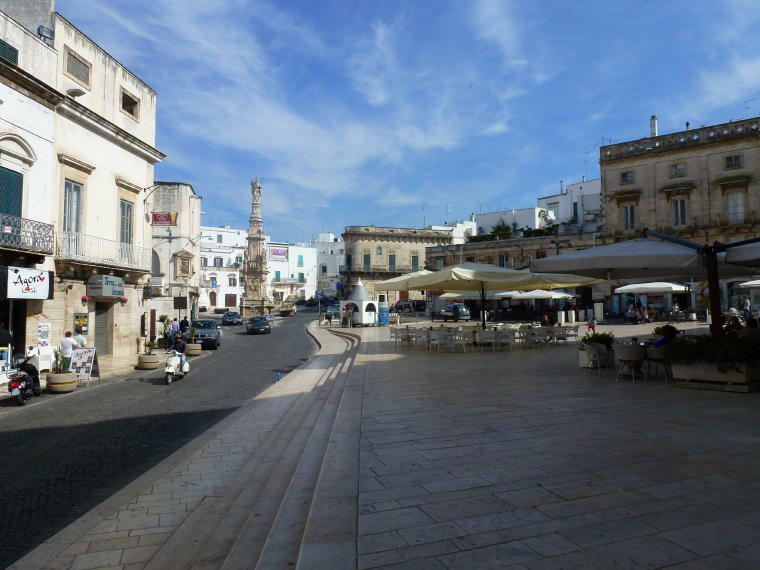 In addition, the owners also run a Trattoria just a few buildings down from the hotel. 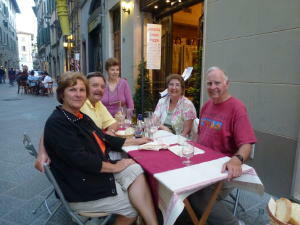 We enjoyed delicious dinners there twice, sitting at an outside table and people watching. On our second day in Florence, we put on comfortable shoes and headed out for more sightseeing. 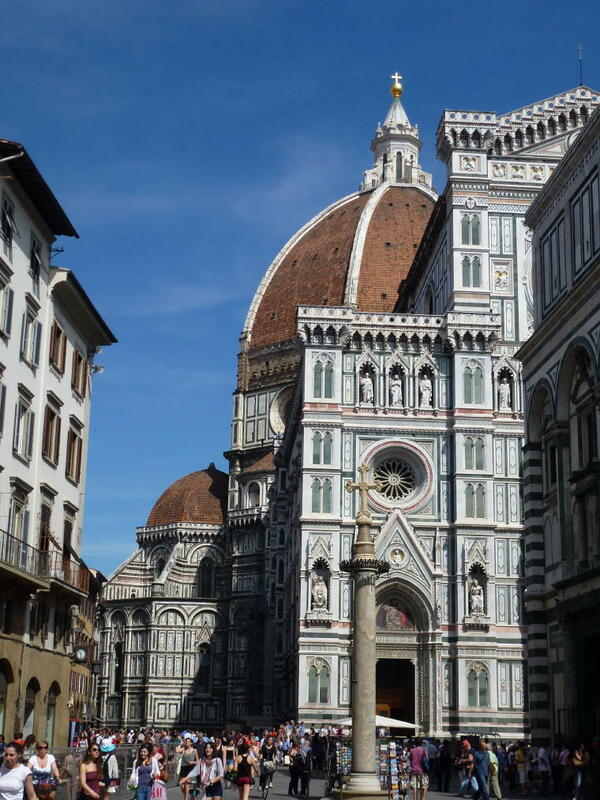 Unlike Rome, everything you want to see in Florence is within walking distance. We had learned that to avoid the lines at some of the main attractions, like the Accademia and Uffizi Gallery, you can purchase a Florence Card. This entitles you to entrance at many of the most important sites as well as the ability to go ahead of those waiting in line. It worked extremely well for us and actually saved us money. We decided to visit the Duomo and hike the 463 steps to the top of the dome. 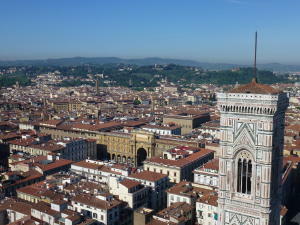 The views of Florence from the top were worth the climb. Although the Duomo was started to be built in 1296, it was initially built with a big hole in its roof, waiting for a grand dome to cover it. But the technology needed had yet to be invented. 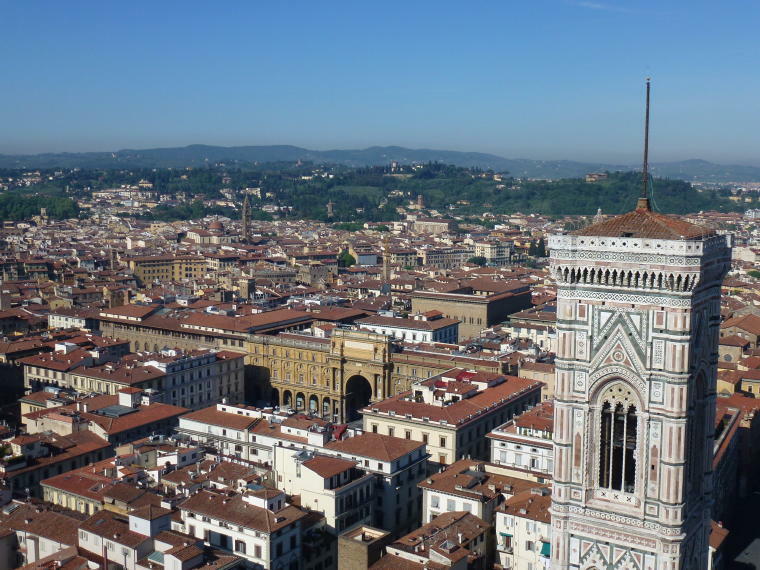 It wasn't until the 1400's, that Brunelleschi figured out how it could be done. It was the first Renaissance dome and the model for domes to follow. 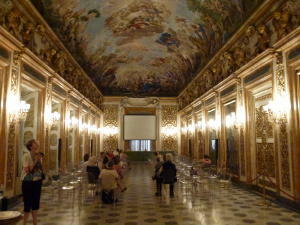 Our next stop was the Uffizi Gallery which has the largest overall collection of Italian paintings. The Uffizi is U-shaped, running around a courtyard. The entire collection is displayed room by room in chronological order starting with medieval. 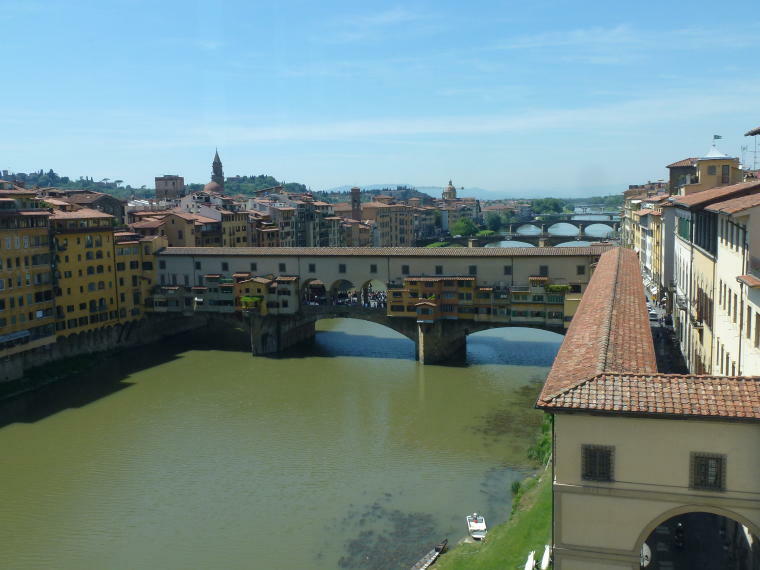 The hallway between the two wings contains sculptures and a great view of the Ponte Vecchio and Arno River. No photos were allowed in the gallery except of the River! Our final stop was the Bargello Museum which contains the best collection of Florentine sculpture. The Bargello was built in 1255 and was once a police station and later served as a prison. Photos were only allowed in the courtyard. But we enjoyed seeing many beautiful works by Michelangelo, Donatello and others. By the time we were finished, we were museumed out and ready for a nap. But first Fred had to have his daily gelato fix. To view more photos from Florence, please go to the Florence Photo Gallery. 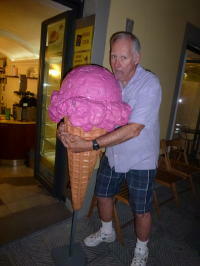 To read about the next location visited, go to Pisa.